Our previous report on Izu-Tobu (BGVN 23:04) summarized the elevated seismicity that began on 20 April 1998 in the eastern Izu Peninsula and started declining around 10 May. The activity included crustal deformation, indicating inflation likely linked to shallow magmatic activity. Izu-Tobu is located 100 km SW of Tokyo and just inland from the coast on the Izu peninsula. Recent reports from the Japan Meteorological Agency (JMA) noted the Tohoku megathrust of March 2011, centered 400 km to the NE of Izu-Tobu, and that Izu-Tobu lacked any signs of correlated behavior as a result of that M 9.0 earthquake event and the numerous aftershocks. Izu-Tobu had been quiet since March 2011 until 17 July when seismicity increased and small earthquakes with epicenters around Ito city (8.5 km N) were detected. Earthquakes on 18 July were M 2.5 and M 2.8 (interim values). A maximum seismic intensity of 1 on the JMA scale was observed in Ito-city and Higashi-Izu town (15 km SSW). Seismicity declined to the usual background level the following day. Ground deformation was observed around seismically active areas. Seismicity along an area from Arai (8 km N) through offshore Shiofuki-zaki (2 km E of Ito-city), increased during 18-23 August 2011, then declined after 24 August. No earthquakes were observed until 22 September when the number of earthquakes temporarily increased at a shallower area around Usami; this activity was interpreted as not being directly related to magma intrusion. Prior to the 22 September 2011 seismic activity, the volumetric strainmeter at Higashi-Izu town (15 km SSW) showed continuous contraction; the tiltmeter at Ito-city showed an apparent change on 18 September. The trend slowed as seismicity decreased; no change was observed after 23 September. GPS measurements did not exhibit remarkable changes and low-frequency earthquakes and tremor were not observed. The Alert Level at Izu-Tobu remained at 1. The Global Volcanism Program has no Weekly Reports available for Izu-Tobu. Earthquakes began 30 June, and by 9 July, more than 19,000 had been recorded. Many were at depths of 4-5 km in a zone roughly 3-7 km NE of Ito, a city of 72,000 about 100 km SW of Tokyo and 40 km NW of Oshima volcano. The swarm included a pair of strong events that occurred within a minute of each other on 9 July at 1109; the first was of M 5.5, the second slightly weaker. At least 18 people were injured by these shocks, and landslides were reported at 16 sites. A year earlier, more than 17,000 events centered farther from the coast were recorded during a month of seismicity that began in late July 1988. Previous swarms had occurred SE of the 1989 epicentral area in 1984 and 1985, and numerous other 1984-86 events occurred in a zone separating the 1984 and 1985 swarm epicenters. The eruption began on 13 July. A JMA seismometer started to record microseismicity at 1829. The captain of the RV Takuyo (Hydrographic Dept, JMSA), carrying out a bathymetric survey in the area, reported hearing an explosion sound from the sea bottom and a 30-second vibration at 1833. One minute later, the JMA seismometer was saturated by seismic events and remained saturated for the next 10 minutes or more. At 1840, the crew of the RV Takuyo saw the sea surface dome upward about 500 m from the vessel, then a gray-black plume rose from the same area. Five more plumes, ~30 m high and 100 m across, were observed in the next 5 minutes. The ejection of each plume was accompanied by violent shaking and vibration of the ship. No more eruptive activity was reported. Seismographs were again saturated at 1902, and another seismic sequence, of different frequency, was recorded at 1907. Another 15 minutes of volcanic microseismicity began at 2130. No detailed reports were available for the next few days, but strong seismicity stopped after 16 July. After the eruption, a bathymetric survey using an unmanned vessel detected a new cone in about 100 m of water at the eruption site. The cone was about 450 m wide, with a summit crater 200 m in diameter, but rose only ~10 m above the sea bottom. The eruption occurred in a region of Recent monogenetic volcanism that has built numerous subaerial and submarine cones (figure 1). One nearby pyroclastic flow (Kawagodiara) on the Izu Peninsula has been dated at about 3,250 BP. No ages are available for the submarine edifices, although very fresh pillow lavas were found downslope during work in a submersible. Figure 1. Topographic and bathymetric map of the E-central Izu Peninsula and nearby waters, after Ishii and others (1988). The 13 July eruption site is labeled with a star. Young submarine cones are labeled with letters and open triangles. Pillow lavas were found in the outlined area labeled D173, 174 Tanaka. Reference. Ishii, T., Watanabe, M., Ishizuka, T., Ohta, S., Sakai, H., Haramura, H., Shikazono, N., Togashi, K., Minai, Y., Tominaga, T., Chinzei, K., Horikoshi, M., and Matsumoto, E., 1988, Geological Study with the "Shinkai 2000" in the West Sagami Bay including Calyptogena Colonies; Technical Reports of the Japan Marine Science and Technology Center, 1988, p. 189-218. Information Contacts: T. Ishii, SI; S. Aramaki, Earthquake Research Institute, Univ of Tokyo; JMA; Hydrographic Dept, JMSA; Asahi Shinbun News, Tokyo. The following supplements preliminary information in 14:6. An earthquake swarm began on 30 June beneath the sea floor E of the Izu Peninsula, an area where swarms have occurred roughly once or twice a year since 1976 (figure 2). The shocks were centered on the NE side of the post-1976 epicentral zone and were shallower than those of previous swarms (figure 3). Seismicity increased sharply on 4 July (figure 4). The strongest event, M 5.5 on 9 July at 1109, reached intensity 5 (JMA scale) in the Ito area and 4 near Ajiro, and had a right-lateral focal mechanism. The number of earthquakes began to decline the next day. However, strong ground tremor, initially with continuous wave trains of varying amplitude, then almost completely saturating instruments, was recorded 11 July between 2038 and 2148 (figure 5). Strong rumbling sounds accompanied the 11 July tremor but no eruption was evident on the sea surface. Another episode of vigorous ground tremor, with sporadic amplitude increases, began about midnight 12/13 July. The explosions observed from the JMSA's RV Takuyo between 1840 and 1845 (14:06) began with updoming of the sea surface, followed by cockscomb ejections. Frequent, audible shock waves jolted the vessel, 0.5 km from the eruption site. Strong, continuous tremor between 1833 and 1917 nearly saturated local seismometers (figure 6). Small tremor episodes continued until 20 July, with the longest total tremor duration on the 14th. Although bubbling was seen at the the eruption site and other locations nearby, no further eruptions were detected at the surface. Figure 2. Seismic activity NE of the Izu Peninsula, 1976-89. Inset box shows superimposed epicentral zones of each of the 12 swarms, with the July 1989 swarm (no. 12) highlighted. Courtesy of JMA. Figure 3. Epicenters and approximate magnitudes of earthquakes in the vicinity of the Izu Peninsula, 30 June-27 July 1989. The approximate site of the submarine eruption is shown by a white triangle within the zone of dense seismicity. Courtesy of JMA. Figure 4. Number of earthquakes near the Izu Peninsula recorded during each 3-hour period, 1-27 July 1989 (SEAN bars) and minutes of tremor recorded daily 10-20 July (circles connected by lines). Courtesy of JMA. Figure 5. Seismograph record, 11 July between 2020 and 2200, showing tremor onset about 2038 and eventual saturation of instruments before tremor ended about 2148. Courtesy of JMA. Figure 6. Seismograph record, 13 July between 1815 and 1945, including the period of eruptions visible at the sea surface. Courtesy of JMA. JMSA bathymetric surveys of the eventual eruption site recorded a flat sea floor before 9 July, but by 13 July, just before the witnessed explosions, the same area had developed a feature ~20 m high and 250 m across at its base. Most volcanologists believed that this feature had grown from submarine eruptions that were not witnessed but probably accompanied the strong tremor of 11 and/or 12 July. A 15 July resurvey revealed an edifice only 10 m high but 450 m in basal diameter, with a crater 200 m across breached on its south side (figure 7). Bubbles rose ~90 m from the crater to the sea surface. Figure 7. Bathymetry of Teishi-Kaikyu measured by an unmanned JMSA survey vessel, 15 July. Contour interval is 1 m. A sketch of the cone is inset at lower right. Courtesy of JMSA. Analysis by the National Research Center for Disaster Prevention revealed that the eruption was preceded by large, apparently precursory, ground tilting ~2.5 km to the SSE. Uplift centered in the Ito area was detected by Geographical Survey Institute levelling surveys, but was generally considered to be a possible precursor to stronger tectonic seismicity. The eruption site lies almost directly between Ito City and Hatsushima Island (roughly 10 km apart), and EDM data from the Earthquake Research Institute, Univ of Tokyo, show a clear increase in the distance between them. However, geologists suspect that the distance change may have been caused by faulting associated with the M 5.5 earthquake on 9 July rather than intrusion of magma. Further References. Okada, Y., and Yamamoto, E., 1991, Dyke intrusion model for the 1989 seismo-volcanic activity off Ito, central Japan: JGR. Shimada, S., Fujinawa, Y., Sekiguchi, S., Ohmi, S., Eguchi, T., and Okada, Y., 1990, Detection of a volcanic fracture opening in Japan using global positioning system measurements: Nature, v. 343, p. 631-633. A seismic swarm, centered ~5 km E of the Izu Peninsula coast at 10-15 km depth, began on 25 December at about 1900 and continued until the 27th (figures 8 and 9). A seismometer (in Izo City) 10 km from the epicentral area recorded about 300 shocks, the largest, M 2.9, on 26 December at 0238 and 0417. Three were felt (at Ajiro Weather Station) 15 km NW of the epicentral area, in the early morning of 26 December. No surface changes were observed. Figure 8. Daily number of recorded earthquakes in the vicinity of the [Izu-Tobu] volcano group, 1989-91. Seismicity associated with the July 1989 eruption saturated instruments. Courtesy of JMA. Figure 9. Epicenters of earthquakes recorded in the vicinity of the [Izu-Tobu] volcano group, 25-27 December 1991. Courtesy of JMA. The December swarm was the first in the area since 20-23 August, when a similar hypocenter distribution was observed. Earthquake swarms have been frequent in the area since 1978, but seismicity has been relatively low since the July 1989 submarine eruption of nearby Teishi Kaikyu. A seismic swarm, centered in the sea a few kilometers E of the Izu Peninsula coast at 4-12 km depth, began on 10 January at about 0200 and continued until the 17th. Seismicity declined on 15 January after about ten bursts, each lasting for a few hours, between 10 and 14 January (figures 10 and 11). Hypocenters were located from the coast (at Kawanazaki, Ito city) to 5 km E of the coast (figure 12). The past two swarms, in August and December 1991, had occurred in the same source area (figure 12) (16:8 and 12). A seismometer 10 km from the epicentral area recorded 2,000 shocks, the largest, M 3.8, on 10 December at 1751. Thirty-five were felt (at Ajiro Weather Station) 15 km NW of the epicentral area between 10 and 14 January. No surface changes were observed and no damage was reported. Figure 10. Hourly seismicity at Izu-Tobu, 9-18 January 1993. Courtesy of JMA. Figure 11. Daily seismicity at Izu-Tobu, 1989-93. Courtesy of JMA. Figure 12. Epicenters of earthquakes in the Izu-Tobu area, 10-18 January 1993. Courtesy of JMA. The strongest earthquake swarm since the 1989 submarine eruption at Teishi Knoll occurred between 28 May and 8 June, with no accompanying volcanic activity. Sources were located around Shiofuki-zaki cape, Ito City, on the E coast of the Izu Peninsula (figure 13). The source area, centered 2 km S of Teishi Knoll, roughly covers the S margin of the 1989 area. Focal depths were at 5-8 km, deeper than the 1-5 km depths in 1989. The seismicity consisted of short-period tectonic-type activity and low-frequency events. Volcanic tremor was not recorded. Figure 13. Epicenters of earthquakes in the Izu-Tobu area, 26 May-7 June 1993. Hatched area shows most densely inhabited area in Ito City. Courtesy of JMA. A total of 9,500 shocks was recorded in Ito City at a seismic station 5 km SW of the source; 25,000 events were recorded in 1989. Personnel at Ajiro Weather Station, 9 km NNW of the source, felt 175 shocks, the strongest of which reached intensity IV on the JMA scale. The largest shock was M 4.3 at 1512 on 31 May, compared to M 5.5 in 1989. No direct damage was caused by the seismicity, but hotels in Ito, a popular spa resort area, lost a reported 1.2 billion yen (> $11 million U.S.) after 60,000 tourists canceled their stay. Frequent EDM and GPS measurements showed rapid expansion of up to 4 cm over Ito Bay from 27 May to 3 June when seismicity was high. Two tiltmeters near the coast of Ito showed a rapid decline (down tilt to the E) and a borehole strainmeter 20 km S of the source recorded rapid contraction during the same period. Ground deformation was [20-50%] that recorded in 1989. The deformation data are interpreted by JMA as suggesting an opening underground beneath the bay at a few kilometers depth. An offshore micro-earthquake swarm began around 0700 on 11 September near Kawanazaki (figure 14). The number of events increased from 61 on 11 September to 125 the next day before decreasing to only 12 on 13 September. The largest event was M 2.6 at 1059 on the 12th. Volume strain meters detected contraction of 10-7. The last earthquake swarm was detected between 27 February and 9 March 1994; it consisted of 287 events, including a M 3.8 earthquake. Figure 14. Epicenter map of events at Izu-Tobu during 11-13 September 1995. Different symbols indicate hypocenter depths: circles, 0-5 km; triangles, 5-10 km; squares, 10-15 km. Courtesy of JMA. On 11-12 and 18 September micro-earthquake swarms occurred offshore near Cape Kawana-zaki, in an area adjacent Ito City on the E coast of the Izu Peninsula (figure 15). After that, few micro-earthquakes took place until late September. An intense swarm began in late September; focal depths shallowed as the swarm shifted N and lay off Cape Shiofuki-zaki (figure 15). Personnel at Ajiro Weather Station, 9 km NNW of the source, felt 33 shocks. Kamata seismic station in Ito City, 5 km SW of the source, registered a total of 3,608 shocks. Two tiltmeters near the coast of Ito Peninsula showed rapid changes in tilt; volume strain meters around the volcano recorded compression. Figure 15. Izu-Tobu epicenter map (top) and plot of focal depths versus time for September through 16 October 1995 (bottom). Courtesy of JMA. Mid- and late-September micro-earthquake swarms occurred offshore near Capes Kawana-zaki and Shiofuki-zaki (BGVN 20:09), an area adjacent Ito City on the E coast of the Izu Peninsula. In late September and early October pulses of seismicity continued off these Capes, trailing off toward mid-October (figure 16). Located ~5 km SW of the epicenters, Kamala Seismic Station recorded 5,881 October earthquakes. The largest earthquake struck at 1142 on 1 October with M 4.8; nearby Into City sustained a JMA-scale intensity of IV. Small-amplitude tremors occurred on both 4 October (four times), and 12 October (one time); low-frequency earthquakes took place on 4 October (four times) and 6 October (one time). Volumetric strain at Higashi-Izu and Ajiro acted in the sense of compression. Figure 16. Hourly earthquakes at Izu-Tobu recorded ~5 km SW of the seismic sources, September-October 1995. Courtesy of JMA. Seismicity at the Izu-Tobu volcano group increased in July. There were 318 earthquakes recorded in July; and the largest one was M 2.4 detected on 12 July. The Kamata seismic station in Ito City recorded 61 events on 15 July, and 45 events on 20 July. Seismicity declined after 24 July. Seismicity increased during the night of 15 October and the Kamata seismic station in Ito City recorded 2,172 events on 16 October; a gradual decline in seismic activity then followed. The largest earthquake had M 4.1. There were five low-frequency earthquakes recorded between 18 and 20 October. The total number of earthquakes registered at Kamata station during October was 5,876. There were 218 earthquakes in November, 61 of them on 3 November. About a month prior to a large seismic swarm, seismicity increased around the coastline N of Ito City; on 8 February JMA's Kamata seismic station recorded 20 events, the largest of which was M 3.5. The earthquake total for February was 59. The large earthquake swarm started on 3 March adjacent to Ito City, a coastal town along the E side of the Izu Peninsula's neck. A migrating swarm had occurred in the same general region during 1995 (BGVN 20:09). The earthquake swarm that began on 3 March occurred in an EW-trending zone, 0-5 km offshore at depths of 2-10 km (figure 17). Small low-frequency earthquakes were reported during 4-6 March but none afterwards. Although the frequency of earthquakes declined after the morning of 5 March, they increased again in the afternoon of 6 March, creating a second seismic peak (figure 18). Figure 17. Epicentral and hypocentral locations of the Izu-Tobu earthquake swarm. Courtesy of JMA. Figure 18. Daily number of earthquakes recorded at Kamata seismic station (1-31 March 1997). Courtesy of JMA. Aircraft surveys of the epicentral area were made on 7 and 9 March by the Hydrographic Department of the Maritime Safety Agency. The sea surface was not stained or discolored. Seismic activity declined after 9 March, and ended on 12 March. The total number of earthquakes recorded at the Kamata Station (10 km SW of the first swarm) was 9,080, including 441 felt events. During March four earthquakes had M >5.0; the strongest one, M 5.7, occurred on 4 March. GPS data gathered by the Geographical Survey Institute in the E part of the peninsula showed a continuous steady swelling of the region around the main earthquake swarm during 3-8 March. The rate of ground deformation (determined with GPS, tiltmeter, and volumetric strain meter) slowed down after 9 March. The ~12-km-long line between Hatsushima and Komuroyama, crossing above the swarm location, extended by a total of 13 cm. The accumulated strain at the Higashi-Izu JMA Station (~20 km SSW of the swarm) was ~6 x 107. Information Contacts: Volcanological Division, Japan Meteorological Agency (JMA), 1-3-4 Ote-machi, Chiyoda-ku, Tokyo 100, Japan; Masato Koyama, Shizuoka University, Institute of Geosciences, Ohya 836, Shizuoka-shi 422, Japan (URL: http://www.ipcs.shizuoka.ac.jp/~edmkoya/Izu/HIMVFe.html); Setsuya Nakada, Volcano Research Institute (VRI), University of Tokyo,Yayoi 1-1-1, Bunkyo-ku, Tokyo 113 Japan (URL: http://hakone.eri.u- tokyo.ac.jp/vrc/erup/izutobu.html). A 13 May report stated that elevated seismicity began on 20 April in the eastern Izu Peninsula and started declining on about 10 May. The peak occurred during 21-22 April, when 1,000 earthquakes took place offshore E of Ito City at depths of 2-9 km (figure 19). The largest earthquake of this swarm, on 3 May, was M 5.7. In total, 10,800 earthquakes were detected during 20 April-12 May; of these, 207 were felt by nearby residents. The activity was located SE of an October 1996 swarm (BGVN 21:11) and S of a March 1997 swarm (BGVN 22:02). The earthquake mechanism was SE-NW compression, similar to the March 1997 events. Figure 19. Map of epicenter locations at Izu-Tobu during 27 April-26 May. Courtesy of ERI. Strain meters and tiltmeters showed slow deformation about 15 hours before the earthquakes started, clear deformation during 21-22 April, and declining deformation thereafter. GPS surveys disclosed 8 cm of extension between Komuro and Hatsushima (12 km apart); by 9 May the line was no longer extending. During the early stages of the swarm and later on 3 May, a change in the water level of a well N of Omuro-yama was observed. Crustal deformation observations showed inflation in the area of seismicity similar to during previous events; scientists suggested that the deformation was linked to shallow magmatic activity. Information Contacts: Headquarters for Earthquake Research Promotion, Science and Technology Agency, 2-2-1, Kasumigaseki Chiyoda-ku, Tokyo, Japan 100; Volcano Research Center, Earthquake Research Institute (ERI), University of Tokyo, Yayoi 1-1-1, Bunkyo-ku, Tokyo 113, Japan; Katsuyuki Abe, Earthquake Information Center, ERI. The Izu-Tobu volcano group (Higashi-Izu volcano group) is scattered over a broad, plateau-like area of more than 400 km2 on the E side of the Izu Peninsula. Construction of several stratovolcanoes continued throughout much of the Pleistocene and overlapped with growth of smaller monogenetic volcanoes beginning about 300,000 years ago. About 70 subaerial monogenetic volcanoes formed during the last 140,000 years, and chemically similar submarine cones are located offshore. These volcanoes are located on a basement of late-Tertiary volcanic rocks and related sediments and on the flanks of three Quaternary stratovolcanoes: Amagi, Tenshi, and Usami. Some eruptive vents are controlled by fissure systems trending NW-SE or NE-SW. Thirteen eruptive episodes have been documented during the past 32,000 years. Kawagodaira maar produced pyroclastic flows during the largest Holocene eruption about 3000 years ago. The latest eruption occurred in 1989, when a small submarine crater was formed NE of Ito City. Aramaki S, Hamuro K, 1977. Geology of the Higashi-Izu monogenetic volcano group. Bull Earthq Res Inst, Univ Tokyo, 52: 235-278 (in Japanese with English abs). Hamuro K, 1977. C-14 ages of Chikubo Central Cone scoria fall, Kawagodaira pyroclastic flow, Omuroyama-Amagi lateral volcano groups, Izu Peninsula. Bull Volc Soc Japan (Kazan), 22: 277-278 (in Japanese). Hamuro K, 1985. Petrology of the Higashi-Izu monogenetic volcano group. Bull Earthq Res Inst, Univ Tokyo, 60: 335-400. Hasebe N, Fukutani A, Sudo M, Tagami T, 2001. Transition of eruptive style in an arc-arc collision zone: K-Ar dating of Quaternary monogenetic and polygenetic volcanoes in the Higashi-Izu region, Izu Peninsula, Japan. Bull Volcanol, 63: 377-386. Hayakawa Y, Koyama M, 1992. Eruptive history of the Higashi Izu monogenetic volcano field 1: 0-32 ka. Bull Volc Soc Japan (Kazan), 37: 167-181 (in Japanese with English abs). Ishii T, Watanabe M, Ishizuka T, Ohta S, Sakai H, Haramura H, Shikazono N, Togashi K, Minai Y, Tominaga T, Chinzei K, Horikoshi M, Matsumoto E, 1988. Geological study with the "Shinkai 2000" in the West Sagami Bay including Calyptogena colonies. In: Technical Reports of the Japan Marine Science and Technology Center, p. 189-218. Koyama M, Hayakawa Y, Arai F, 1995. Eruptive history of the Higashi-Izu monogenetic volcano field 2: mainly on volcanoes older than 32,000 years ago. Bull Volc Soc Japan (Kazan), 40: 191-209 (in Japanese with English abs). Saito T, Takahashi S, Wada H, 2003. 14C ages of Omuroyama volcano, Izu Peninsula. Bull Volc Soc Japan (Kazan), 48: 215-219 (in Japanese with English abs). Yamamoto T, Soya T, Suto S, Uto K, Takada A, Sakaguchi K, Ono K, 1991. The 1989 submarine eruption off eastern Izu Peninsula, Japan: ejecta and eruption mechanisms. Bull Volcanol, 53: 301-308. Remarks: The 1997 dyking event lasted 9 days and was accompanied by seismicity and deformation. The peak rate of dyke opening was 50 mm/day. Reference List: Aoki et al. 1999; Cervelli et al. 2001. Aoki Y, Segall P, Kato T, Cervelli P, Shimada S, 1999. Imaging magma transport during the 1997 seismic swarm off the Izu Peninsula, Japan. Science, 286(5441): 927-930. Remarks: Ground tilt changes prior to eruption can be modeled by two tensile faults (magma intrusions) and a right lateral reverse fault (earthquake). Reference List: Okada and Yamamoto 1991. Okada, Y., & Yamamoto, E., 1991. Dyke intrusion model for the 1989 seismovolcanic activity off Ito, central Japan. J. Geophys. Res., 96(B6), 10361-10376. There is no Emissions History data available for Izu-Tobu. 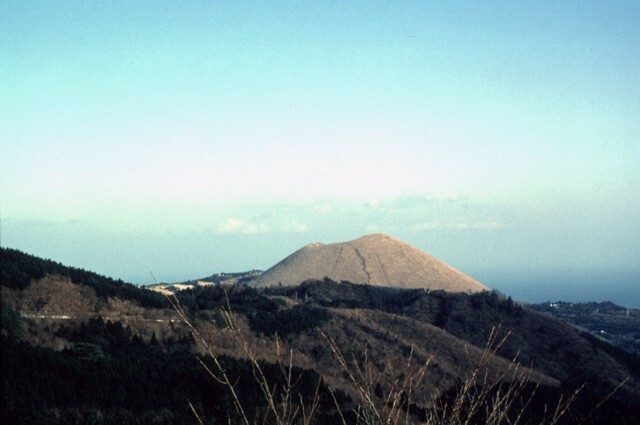 The Omuro-yama scoria cone, one of about 70 subaerial volcanoes in the Izu-Tobu volcanic field, formed about 5000 years ago. Omuro-yama is located in the SW part of the Izu-Tobu field. The cone rises 300 m above a low shield volcano, which slopes down to Sagami bay, visible at the right side of the photo. Lava flows forming the shield were emitted from vents NE and south of the cone. 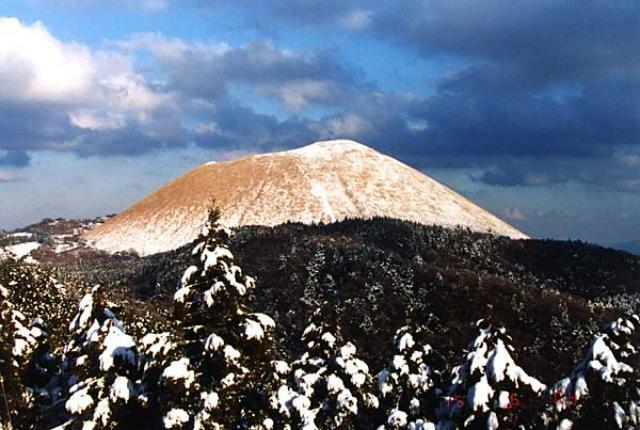 Snow drapes the western flanks of Omura-yama scoria cone in the Izu-Tobu volcano group. Omuro-yama, the most well-known feature of the Izu-Tobu volcano group (also known as the Higashi-Izu volcano group), formed about 5000 years ago. The volcanic field is scattered over a broad, plateau-like area of more than 400 sq km on the east side of the Izu Peninsula. About 70 subaerial monogenetic volcanoes formed during the last 140,000 years, and chemically similar submarine cones are located offshore. Copyrighted photo by Akira Takada (Japanese Quaternary Volcanoes database, RIODB, http://riodb02.ibase.aist.go.jp/strata/VOL_JP/EN/index.htm and Geol Surv Japan, AIST, http://www.gsj.jp/). Large Eruptions of Izu-Tobu Information about large Quaternary eruptions (VEI >= 4) is cataloged in the Large Magnitude Explosive Volcanic Eruptions (LaMEVE) database of the Volcano Global Risk Identification and Analysis Project (VOGRIPA).